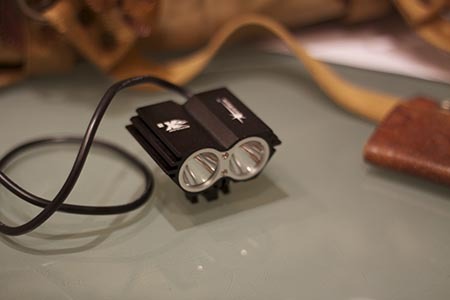 Our SolarStorm 2x CREE XML U2 LED bike light has always been compromised by it’s battery. I doubt we’ve ever really had more than an hour from the lamp and in recent weeks the battery performance has dropped off a cliff. Having the dual-lamp configuration, the SolarStorm was always going to burn through the power quickly, but I’ve been disappointed with the speed at which this happened, and suprised that it was supplied with such a low capacity battery. So a few weeks back I bought a bigger capacity 15600mAh battery from ebay. First impressions are good and the battery keeps the SolarStorm running on full-power for well over two hours. These are garden tests ahead of committing myself to a trail test, but the low power setting appears to keep running for over four hours. Update – 20th Nov 2014 – I’ve got a couple of two hour rides under my belt now with this battery and the SolarStorm, not to mention quite a few nights walking the streets of Malemsbury looking for a lost cat, and the battery is holding up well. The light is still burning well after two hours, so a major improvement. The original battery however won’t hold any charge, so has been resigned to the bin (at the recycle centre), which is a warning that that some of these cheap Chinese lights will be duffs. Previous PostDoes hi-vis work for cyclists?